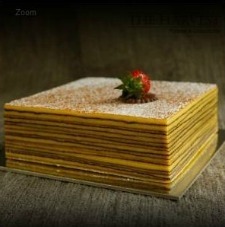 This week’s Friday Favorite on BeFreeForMe goes to Euforia Confection’s Gluten-Free Thousand Layer Cake. Euforia’s Thousand-Layer Cakes come in two flavors: Vanilla – with a familiar and comforting melt-in- your-mouth flavor, or Spice – a sassy blend of spices that creates a ultra-chic spice cake even Grandma would love. I love that these cakes can be frozen for up to 6-months– which is perfect for those last-minute get-togethers. This cake is also great served as a birthday cake, or eaten “just because”. All these reasons, plus thousands more, are the reasons why Euforia Gluten-Free Thousand layer Cake is this week’s Friday Favorite on BeFreeForMe.com. Congratulations! This entry was posted on Thursday, July 5th, 2012 at 5:25 pm	and is filed under Friday Favorites. You can follow any responses to this entry through the RSS 2.0 feed. You can leave a response, or trackback from your own site. These look amazing and I am sure they taste even better. We are happy that you enjoy euforia thousand-layer cake and to see your wonderful review. It is indeed a healthy and gluten free cake. Just to give you a head ups that we will be releasing lemon flavor soon. Again, thank you for this review. Thanks, euforia for making such a great gluten-free cake! I can’t wait to try the lemon flavor!